This is a great scanner for occasional scanning of single pages. It doesn’t have an auto document feeder, so you’re not going to use it for large scanning jobs. You’ll use it to scan your W-2, or old family photos, or that newspaper clipping your mom saved from when you did something famous in your home town. For $129 it provides a good deal of functionality, including the ability to send your scanned items directly to a number of online services (Flickr, Picnik, etc). It’s small and lightweight, which makes it a no-brainer to take with you on the go; but the form factor does present some placement issues. I’ve enjoyed using Doxie. It’s easy to use, and it has a sassy attitude, as evidenced in the screenshot above. It’s certainly not a selling point on its own, but the sense of lighthearted fun will help ease nervous users into successful operation. Scan quality is good, and there’s plenty of control provided for different kinds of scanning jobs. 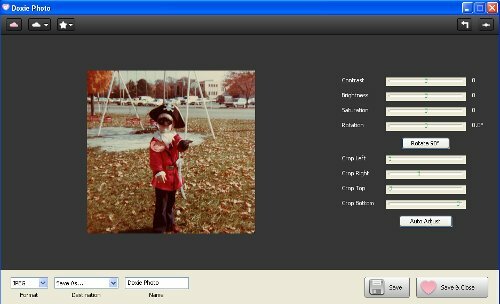 Scanning photos and documents are supported with two different interfaces via a drop-down (on Windows) or tab (on Mac). Documents default to 200 dpi in greyscale, and photos default to 300 dpi in color. I admit I didn’t try to scan a photo in document mode or a document in image mode because that would just be silly. Resolution scales from 75 dpi all the way up to 600 dpi. Scans can be in black-and-white, greyscale, or color. Once scanned, you can save the image to a local file, twiddle a few settings (exposure, contrast, saturation, etc), send it to a local application, or send it to a cloud application. All in all, I had no problems using the scanner or the software. No software is provided with Doxie. This is an interesting decision, but I think it’s a good one. Instead of installing outdated software via Plug-and-Play, Doxie asks you to visit www.getdoxie.com/start to download the latest version of the software. 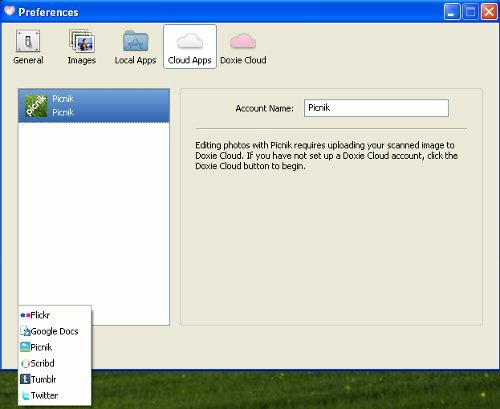 The upside is that absolutely no fluff add-on software is “helpfully” bundled with it: you get just the Doxie software and are expected to use existing software on your computer or a cloud-based application to manipulate your scans. I have two basic gripes with Doxie. First, the software requires you to launch it manually. 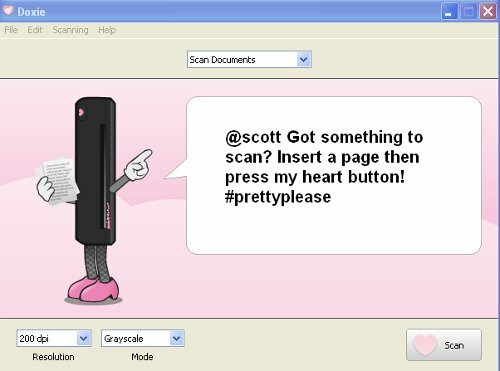 Pressing Doxie’s heart-shaped “scan” button doesn’t do anything at all if the software isn’t running. This is a minor annoyance; but it’d be really nice if Doxie could hook into the USB sub-systems on Mac and Windows so that the application launches when the button is pressed. My second beef is the placement of the USB port: it’s on the back right of the unit (as you look at it from the front), behind the heart-shaped button. This means that if you place Doxie to the right on your computer the USB cable falls right in the path of your documents as they exit the scanner. This is hardly a make-or-break situation, but I found it caused some consternation as I scanned fragile older documents and they butted into the USB cable. I would have liked to see the USB port on one of the ends of the tubular unit, rather than the back surface. All in all, Doxie is a good product. If you need convenience scanning, or are looking for something more portable than a huge flatbed scanner, Doxie is a good choice.